3) The lost item now displays in the Lost/Claimed Returned/Long Overdue, Has Unpaid Billings section of the patron record. If you need to balance a bill with a negative amount and close the linked lost circulation record without making a refund (removing the item from the Lost, Claimed Returned, Long Overdue, Has Unpaid Bills panel on the Items Out screen), you need to add two dummy bills to the existing bills. The first one can be of any amount (e.g. $0.01), while the second should be of the absolute value of the negative amount. Then you need to void the first dummy bill. The reason for using a dummy bill is that Evergreen will check and close the circulation record only when payment is applied or bills are voided. 4) The Claimed Returned item now displays in the Lost/Claimed Returned/Long Overdue, Has Unpaid Billings section of the patron record. 5) The Claimed Returned item adds to the count of Check Outs that are Claimed Returned in the patron summary on the left (or top) of the screen. 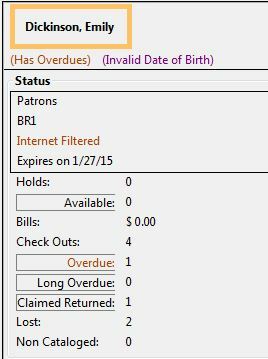 It also adds to the total Claims-returned Count (including those that are current Check Outs and those that have since been returned) that is displayed when editing the patron’s record.